Many great actors have tackled the coveted role of Hamlet from Kenneth Branagh to Jude Law and everyone in between but did you know the one actor you've been holding out for in the coveted role was Gary Busey? Yes, you read that correctly. Gary Busey. Once upon a time Gary Busey was a real actor. Now he's a parody of his former self. As a former Academy Award nominee, Today's Gary Busey has turned into a former “Celebrity Apprentice” contestant with a knack for the crazy and his infamous Busey-isms, you know when Gary Busey takes a word and spells it out giving each letter a word that then reveals the Gary Busey definition of the said word. As the epitome of what a Fringe show should be, the title says it all: Gary Busey's One Man Hamlet (as performed by David Carl). Comedian David Carl takes on the role of the iconic actor who takes on every single role in the Shakespearean drama all while doing a very intricate text analysis and recapping his career. Did you know there are a lot of scenes in Hamlet that are just not important? Gary Busey taught me that! Gary Busey’s One Man Hamlet (as performed by David Carl) is a surprisingly great character study on the bafoonery that is today’s Busey. Carl has clearly done his homework, nailing down everything from his mannerisms to his screech to his teeth. Unless you've been living under a rock, the new Busey is known for his crazy antics and Buseyisms of words and that awful commercial where he yells his name at his TV. The man has turned into a parody of himself so allowing this character to take on Shakespeare's potentially nutty character just makes sense. The writing of the piece is near perfection. 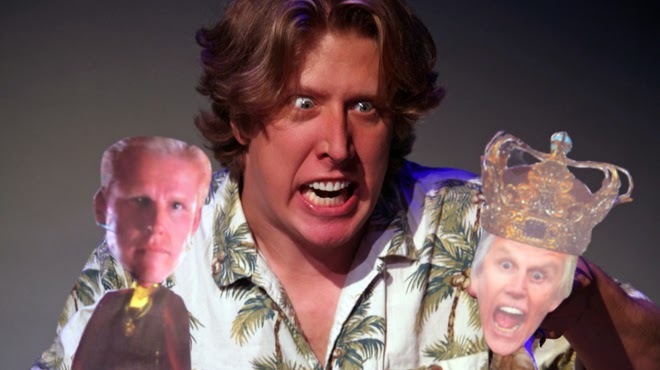 With Busey-faced puppets representing characters to the Hair version of "What a Piece of Work is Man" to the final fight where he battles himself on screen, the bits are what make this abridged version of Hamlet a success. Carl’s Busey's use of a microphone and announcement every time he changes character is brilliant, never getting old. Where Carl struggles is giving Busey the ability to play the characters. To differentiate each role, Carl as Busey puts on different voices, though some are not very Busey. It's a struggle that may be on the button of the priority list with everything else so great and fine-tuned. But with the rest of the show in brilliant condition, mastering this will give the solo show greater life. Director Michole Biancosino guides Carl with great ease. Biancosino knows how to give each Busey bit a different direction, rarely ever leaving too much unfunny air. Lighting designer Derek Wright does a phenomenal job bringing variety to the space. The video design by Carl and Jeanette Sears is hilarious with the added bonus of seeing Carl’s painted Buseyisms. The fight sequence is one of the greatest moments of the show. The title alone is a reason to be intrigued. You should be fearful before entering Gary Busey’s One Man Hamlet (as performed by David Carl). But when the show concludes, you’ll be pleasantly surprised just how brilliant Carl’s performance is.